Michele Satchell is the Equal Employment Opportunity Manager at the United States Mint. Michele started at the United States Mint in 1990 as an Accountant in the Office of Accounting and Financial Systems. During the next several years, she progressed to positions of greater responsibility in the Office of Financial Planning, Analysis, and Review. In 2005, she was selected as the Alternative Dispute Resolution (ADR) Program Manager. As ADR Program Manager for the Mint, Michele was responsible for administering the ADR program agency-wide and provided technical guidance and direction to employees, management, and the union to address workplace issues. 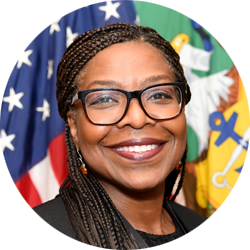 In 2008, she assumed the role of the Equal Employment Opportunity Manager at headquarters and assisted in planning, developing, and administering a comprehensive EEO program which included serving as the Federal Women’s Program Manager, Hispanic Employment Program Manager, Disability Employment Program Manager, and Diversity Intern Program Manager. In June 2016, Michele was selected to serve as Senior Advisor to the Chief of Staff of the United States Mint. Effective January 20, 2017, she became the Senior Advisor to the Acting Deputy Director of the United States Mint. Michele has a Bachelor’s of Science degree with a major in Business Administration and a minor in Accounting from Shepherd College.